Dora the Explorer: Journey to the Purple Planet is an action-adventure video game based on the television series Dora the Explorer, developed by Monkey Bar Games, published by Global Star Software and powered by Vicious Engine. The game was released for GameCube in North America on October 13, 2005, and later in PAL regions on December 16, 2005. Based on the show, The game is about Dora that has something she wants to do or somewhere she needs to go, with her monkey Boots. Dora has three, or, in some double-length episodes, four, places to go, with the final place as the destination. 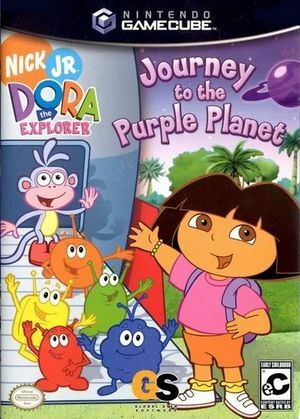 The game is about Dora and Boots who finds some lost aliens from the purple planet. However, to take them home, she and Boots are required to collect keys to open the space gate, leading to the Saturn planet. To fuel the rocket ship loaned to them, Dora and Boots need to collect 10 space gems in a level. Caitlin Sanchez voices Dora in the TV series. However, in this game, Dora is voiced by Kathleen Herles instead. The graph below charts the compatibility with Dora the Explorer: Journey to the Purple Planet since Dolphin's 2.0 release, listing revisions only where a compatibility change occurred. This page was last edited on 15 January 2019, at 07:22.